Race Across The Great Divide celebrates the decade that saw Australia emerge from a motorcycling backwater to become the epicentre of some of the most successful two-wheel talent the world has ever seen. Featuring 330 photographs over 320 pages, the coffee table book explores motorcycling’s spread across the regions in the 1970s that inspired a new generation of rural racers to take on the world in numbers never seen before. The foreword to the book is written by Wayne Gardner, Australia’s first world 500cc champion. He emerged from Wollongong’s minibike scene in 1974 to capture motorcycle racing’s most coveted crown just over a decade later. “It might be a cliché, but the 70s was the Golden Age of motorcycle racing and I will never forget it,” writes Monaco-based Gardner. “It was an amazing time with bikes and racing all over Australia, and I’m so fortunate and proud to have been part of it. 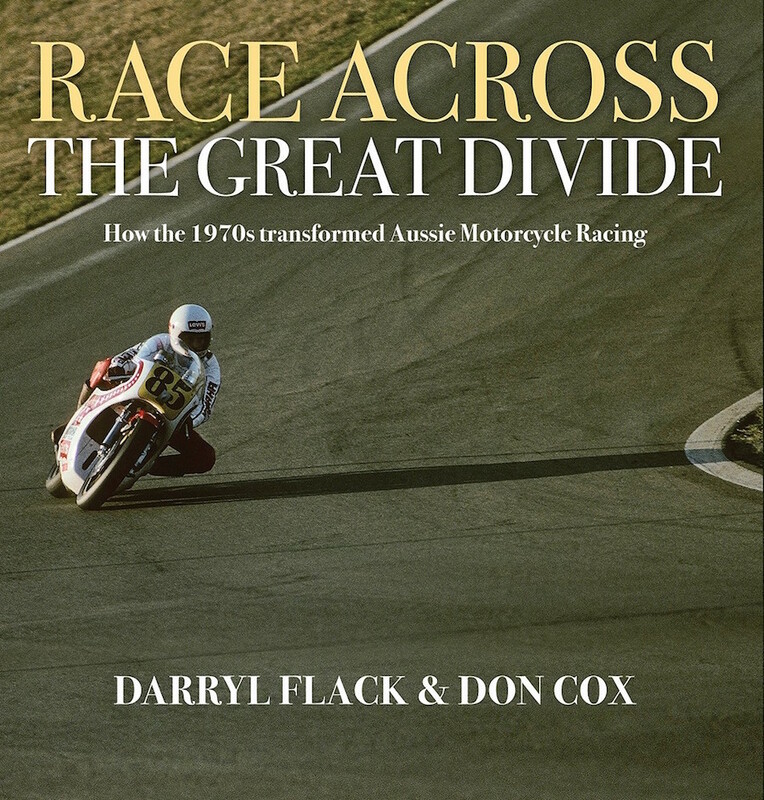 Written by Don Cox and Darryl Flack, Race Across The Great Divide is rich in vivid anecdotes and 330 unpublished and classic images, bringing to life the Easter Bathurst races, the Castrol Six-Hour, Laverton TT, New Zealand’s Marlboro Series, and many races in between. Part road trip, part reflection on the Golden Age of motorcycle racing, the book is also a celebration of the most iconic era of Aussie and Kiwi racing through its colourful characters and the victories that made them legends from Ron Toombs, Bill Horsman and Bryan Hindle to Geoff Perry, Warren Willing, Gregg Hansford, Ken Blake, Kim Newcombe, Murray Sayle, Peggy Hyde, John Woodley, Stu Avant, Graeme Crosby, Rick Perry, Ray Quincey and Ron Boulden.